A pinch of Nutmeg pwd. Wash & soak soya granules as per packet instructions. Heat a pan/wok with oil till hot. Reduce heat & saute onions till soft & translucent. Add in the green chillies, turmeric pwd. & stir. Next add ginger-garlic paste, all the masala powders mentioned above & saute well on low heat till the rawness disappears. Slide in the chopped tomatoes, sugar & cook till tomatoes are completely soft. Now add the soya granules & mix well. Let it cook for about 2 mins. Keep stirring occasionally. Pour in about ½ cup water & let it cook for about 5 minutes on med. heat. Then add the green peas, mix well & let it cook on sim for another 3 mins. Adjust salt to taste & gravy consistency as desired. Garnish with chopped fresh coriander & quarters of lime. 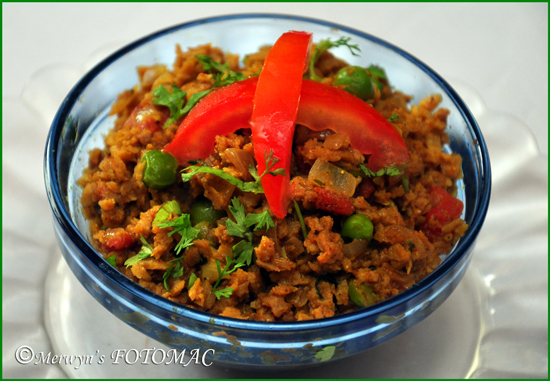 Serve with pulao or your favorite roti or bread. Glad to follow you 🙂 Looking forward to see more such interesting recipes from you !